I was excited to visit Halong Bay, really excited. It was somewhere I had wanted to visit since I was young. 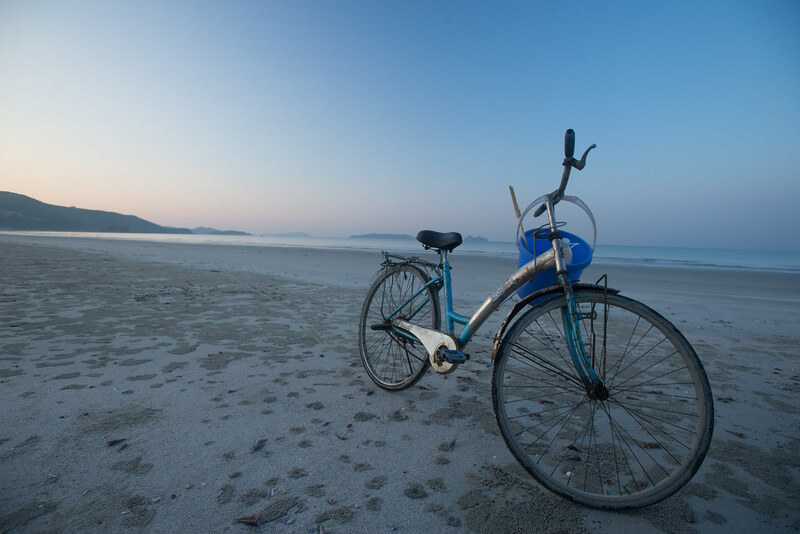 However, whilst cycling towards Hanoi most backpackers and travellers we spoke to told us they were disappointed with their trip to Halong Bay and the reason they gave was that the tour they booked was a huge let down. 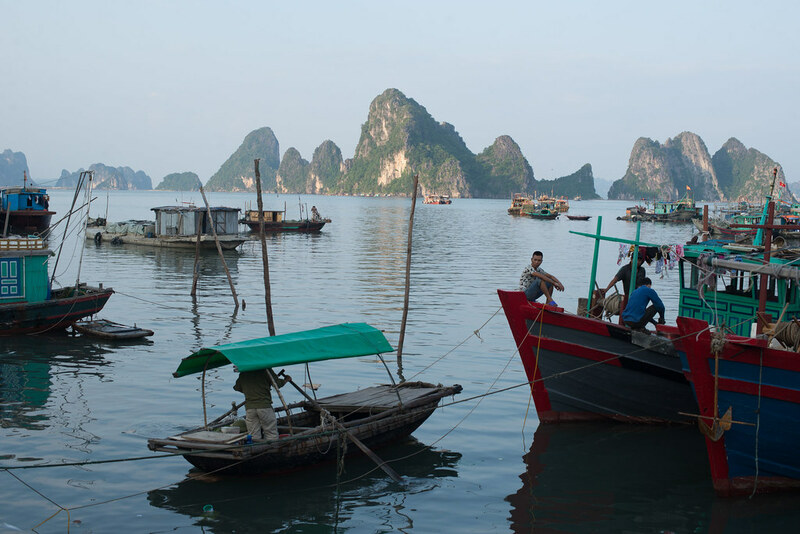 Had I missed the boat with Halong Bay – was it too late to see this area in a non-touristy, unspoilt way? Turns out it isn’t, it just takes a little bit of research and the willpower to resist the sales pitches of the tour operators. So here is our advice on how to visit the famous bay independently. Enjoy its hidden charms and absorb all it has to offer without spending a lot of money and being traipsed around the well trodden, crowded sights on a sub-standard tour. Hire a moped! It is so much fun and not nearly as scary as you might think. We rented a Honda Alpha Wave 100cc moped from Rent a Bike VN as they had very good reviews and seemed straight forward and honest. We had no problems at all and the whole process was very easy. You just need to leave your passport as a deposit and off you go. We decided to attempt a visit to the less touristy islands that are situated in Bai Tu Long Bay, which is slightly North East of its more famous sister – Halong Bay but just as beautiful. The islands in this bay are still largely undeveloped and is not visited by many tourists which makes it much more serene and laid back. 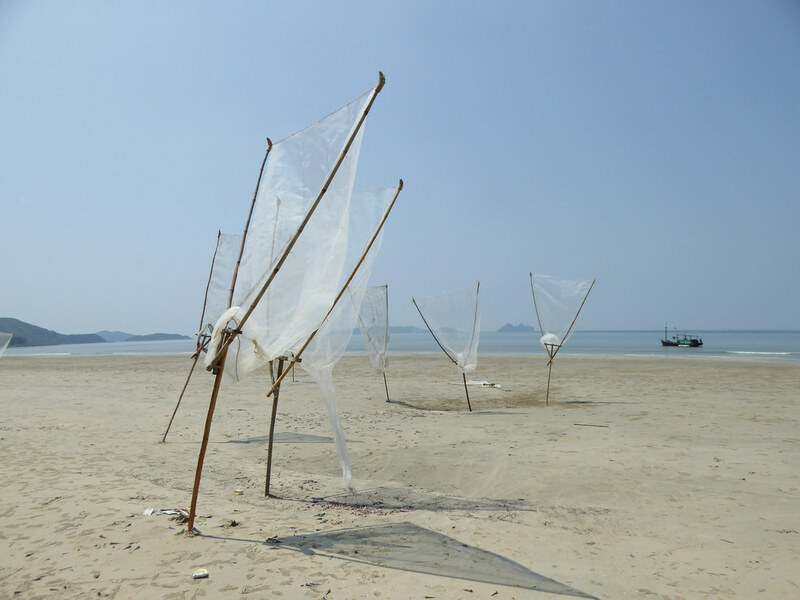 There are four main islands; Co To, Ngoc Vung, Quan Lan and Tra Ban. They differ in the facilities they have for tourists and there are a number of different places to get the ferry out to the various islands which can make it a little confusing but the lonely planet website has some pretty reliable information on ferry times. We only had time to visit Ngoc Vung. We travelled from Hanoi to Cai Rong port on Van Don Island, it is roughly 200 kms which took about 5 hours by moped – with breaks. The port here is a bustling place with lots to absorb and great for people watching especially when the fishing boats arrive. There are also lots of restaurants and hotels that are pretty reasonably priced. We missed the afternoon boat so ended up staying the night at a hotel a few metres from the port. 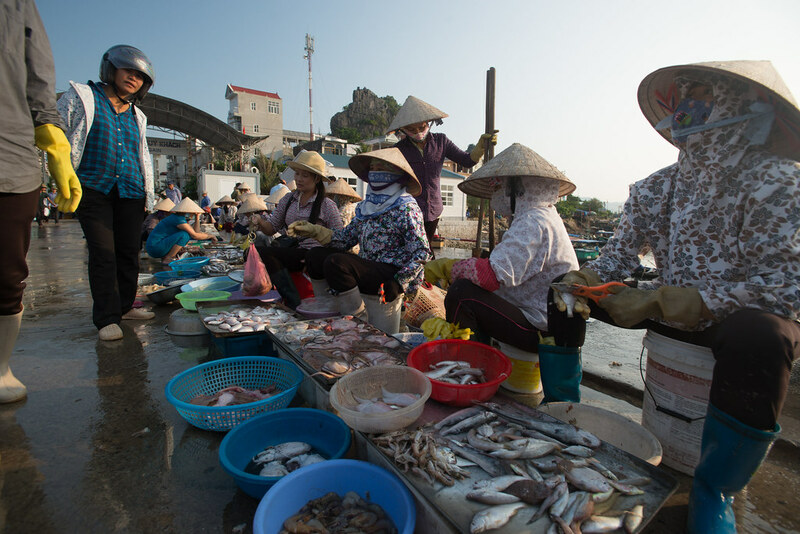 The boats to Ngoc Vung left at 7am and took roughly 2.5 hours. There were a couple of hurdles to jump before we boarded the boat. Firstly the island is military controlled and you need to register before you are allowed on the island. This had us slightly worried but it turned out to be very easy, we just had to let the military guy at the port write down all our passport details and we were done. This also happened when we arrived on the island. The second slight problem was getting the moped onto the smallish wooden ferry. Mopeds are fairly heavy and to get it onto the boat it has to be carried down some stairs then across a rickety, narrow plank! There are plenty of guys who offer to do it for you at pretty high prices, if you hold out for long enough the prices do come down considerably and are definitely negotiable. We ended up paying 40,000 VND as I didn’t feel strong enough to make it across the plank carrying the moped! However, we only ended up paying this loading fee once they tried to make us pay again when we offloaded but we just politely refused, befriended them and then helped them unload their bags and they ended up just helping us unload the moped without any fee. This happened on our return journey too. The island of Ngoc Vung was really beautiful, there were hardly any roads and only a couple of small villages. It is a good idea to bring your own food as there are not really any shops, only a few stands selling the most basic of goods and a few pieces of fruit or veg. We decided to stay one night but if you don’t fancy an overnight stay there is a boat back in the afternoon, best to check the time when you arrive on the island. The best part of the island by far is the spectacular sandy beach on the eastern shore of the island that was completely empty when we were there apart from a couple of fisherman. We spent most of the day swimming, lazing in the shade and picnicking – it was great. The beach backs onto a wooded area which provides great shelter from the sun and lying just off the coast are some limestone cliffs jutting dramatically out of the water – making the whole scene very picturesque. We took the moped for a spin around the island on every road that existed and which didn’t take very long. We even stumbled across a hidden army bunker in a cliff face, where an army guy came out to shoo us away along with his very scary, barking dogs! The island is very pretty and it is great for experiencing authentic island life. However, apart from the beach there is not much to do, so if you need to be entertained it might not be the place for you. There are no cafes, bars or shops and we only managed to find one place that would serve us food, and it was some pretty poor phó – but the locals were very friendly and nice. There seemed to be a hotel and beachside resort in the process of being constructed while we were there so maybe things are changing on the island. 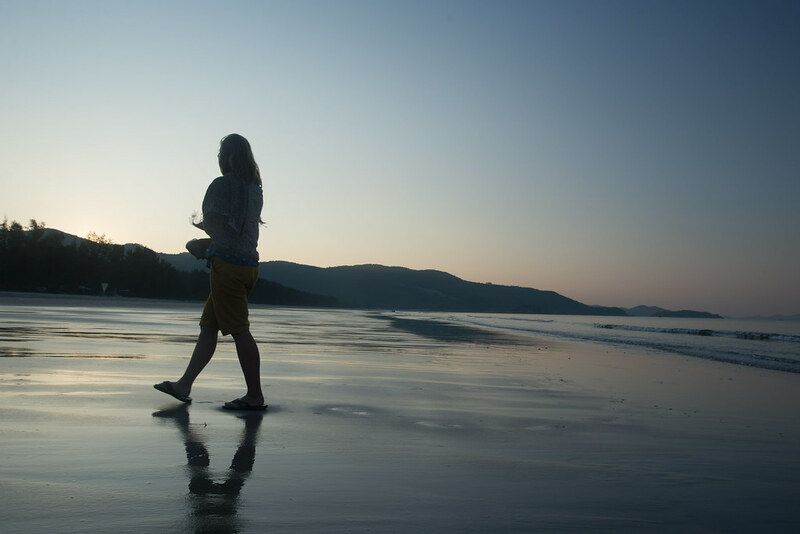 We liked the peacefulness and the fact you felt very far off the beaten path. While on the island we managed to wild camp, which we think is illegal so if you do try it, make sure to be well hidden. We camped next to the beach amongst the trees and bushes. It was great listening to the sea as we fell asleep. After one night on the island we had explored as much as Ngoc Vung had to offer and we took a very early ferry back to Cai Rong (Ask what time the ferry leaves in the morning when you land at the island). We would definitely recommend this island for its tranquility and laid back island lifestyle, however, if you are searching for somewhere with a few more facilities for tourists but still off the beaten track we heard great things about Co To island, it apparently has a few small but decent accommodation options and at least one good restaurant. The next place we decided to visit was Cat Ba island, which we did with some trepidation as we were concerned it would be too busy and touristy for us to enjoy. It is holiday season in Vietnam and we had heard that it is not a great time to travel as it is so busy with Vietnamese tourists. It turned out to be a great contrast to the trip to Ngoc Vung and we really enjoyed our time on the island. We drove the moped down to Halong Bay and took the afternoon public ferry to the island, there are lots of ferries every day and it takes only one hour. It was full with Vietnamese tourists but we only spotted one other westerner. We were really surprised as it is so easy to do and so cheap. 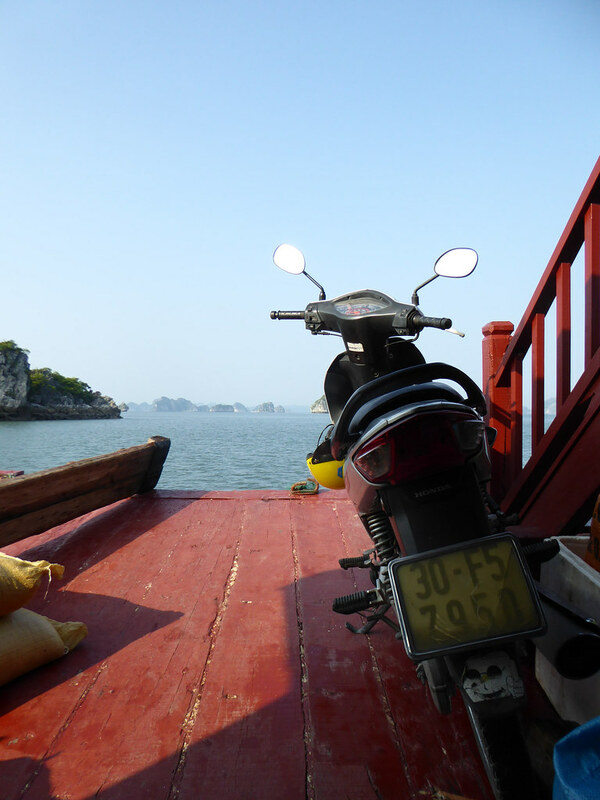 This time the ferry was bigger and we could drive the moped on, no carrying it across a precarious wooden plank – hooray! The ferry takes you to the northernmost point of the island, Gia Luan harbour, and you then have to travel perhaps 18 kms (25 mins) to the main town. This is a really beautiful ride through the uninhabited, jungle covered hills and you really get a chance to see how spectacular Cat Ba Island is. When you arrive at the main town, it is pretty depressing – all high-rise, cheap-built hotels and the place is rammed with restaurants and tourists. It is best to avoid it in our opinion – eat and then run if you can! There are many much nicer places to explore. One beach was so full you could barely see the sand so we decided to skip it and head elsewhere, happily we came across another one that was fairly quiet and just seemed to have a few locals swimming there. it was a small, pretty cove complete with an abandoned, half completed resort sat just up from the beach and nestled into the cliffs. Accommodation here is plentiful but a little more expensive than other places in Vietnam as to be expected. To save money and because it is fun, we ended up wild camping on the beach under some banana leaf resort umbrellas and hidden from view. It was a great camping spot. Our time on Cat Ba island was spent exploring the quieter areas of the island by moped, sea kayaking with Blue Swimmer. Half a day with a two-person kayak cost $15 and was well worth it. We got to see the floating villages, deserted beaches and some great little nooks and crannies in the limestone cliffs. We also visited the hospital cave which was kind of interesting but there is not really a whole lot to see and you are in and out in maybe 3 – 5 mins! The entrance fee is cheap though. We left the island from a different port (Ben Binh wharf), with a short ferry that takes you to Cat Hai island where you then have to drive across the tiny island to take a second ferry to Haiphong. Haiphong is closer to Hanoi than Halong Bay so this was more convenient option for us and its always interesting to take a different route. 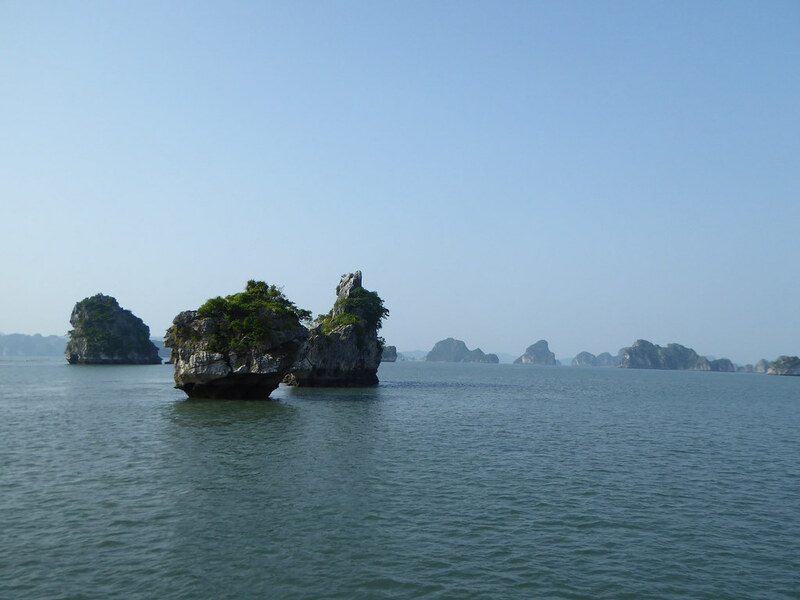 We felt lucky to experience Halong Bay in a way that many tourists don’t. We definitely got a chance to see some hidden gems while taking advantage of some of the comforts and activities available to tourists. 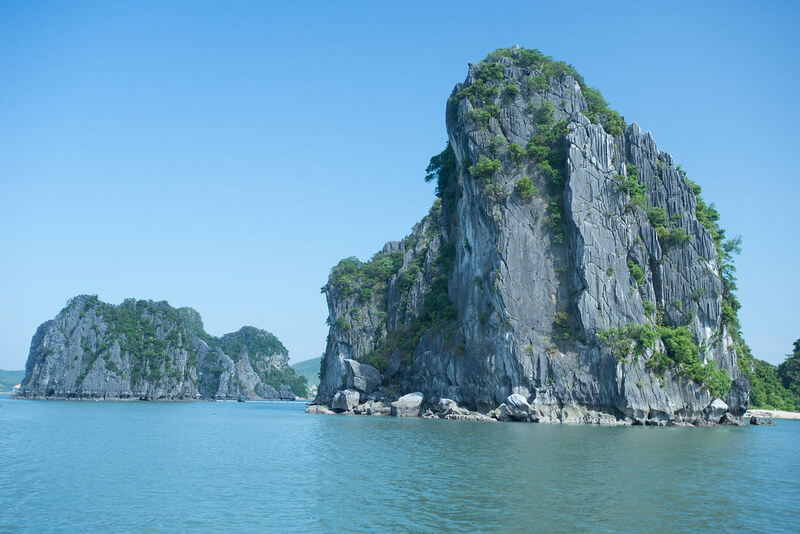 Halong Bay is truly a beautiful place and one well worth visiting; we would definitely recommend getting off the beaten track, avoiding the organized tours and boat cruises – get a moped and go it alone… you won’t regret it! Hiring the moped: 42 dollars for the week. Fuel costs: 50 – 60 thousand VND to fill the tank. We filled up three times spending 150,000 VND on petrol in total. 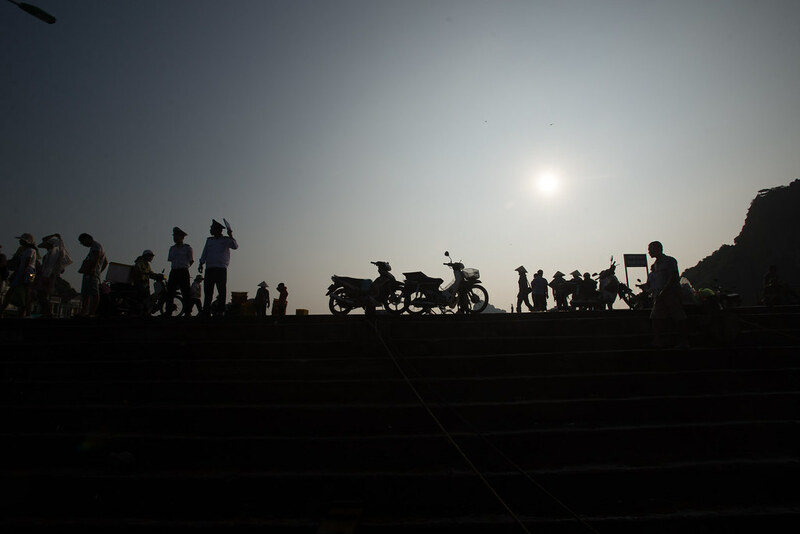 Ferry from Cai Rong to Ngoc Vung; 60,000 VND per person plus 40,000 per moped each way. Be aware of the potential loading/offloading moped fee! 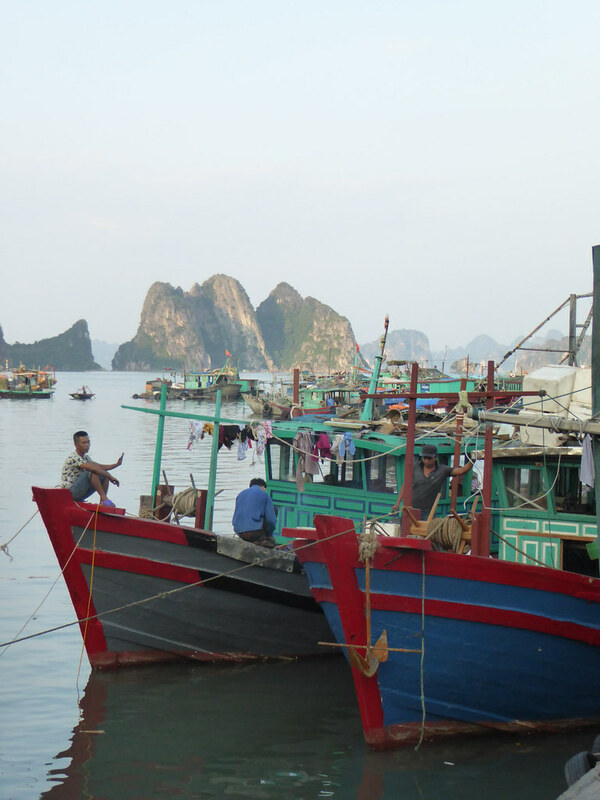 Ferry from Halong Bay to Cat Ba: 70,000 VND per person, plus 20,000 for moped. 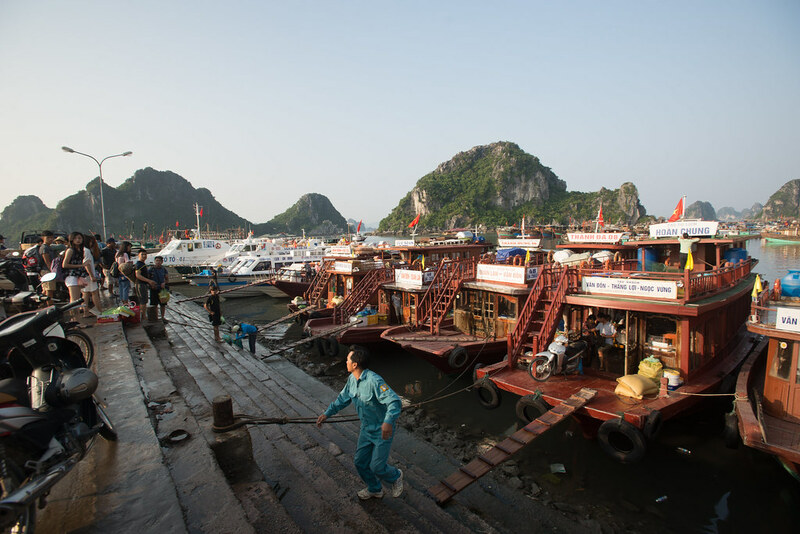 Cat ba to Haiphong: 2 short ferries. First ferry: 6,000 per person, 20,000 for a person + moped. Second ferry; 11,000 per person, 30,000 for a person + moped. We been to Cai Rong a few times and love the area. We took a cheap hotel on the harbour and compared to Halong its great. The less people know about it the better. Quan Lan is nice and may try another next year. The small local ferries being the best. We weren’t sure if after Burma we should head South towards Malyasia or East towards Hanoi. The weather seems bad that time of year but from your pictures looks good. Northern Vietnam in early June. What do you think? Hey Fred, Thanks for the comment. 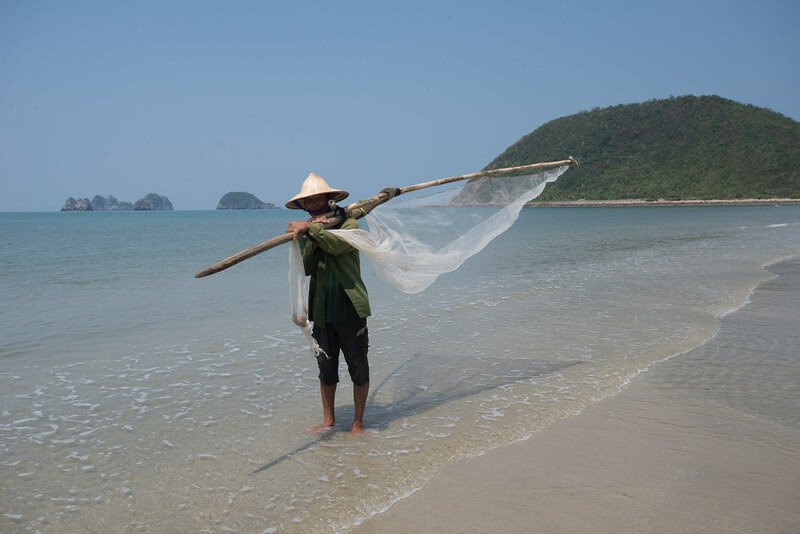 We were torn between not telling anyone about Cai Rong and the islands and publishing our post – it was so nice that no tourists were there, maybe we should have kept it a secret! I think early June is supposed to be nice as the monsoon season hits later on. We got lucky with the weather and didn’t have too much rain for July. Monsoon season can be okay also as often it just rains for a few hours a day and the rest of the time it is nice, if a little on the hot side! I would not worry about it too much and just go for it. When will you be in Burma?